Over the weekend I participated in my first ever triathlon. And guess what? I did it! 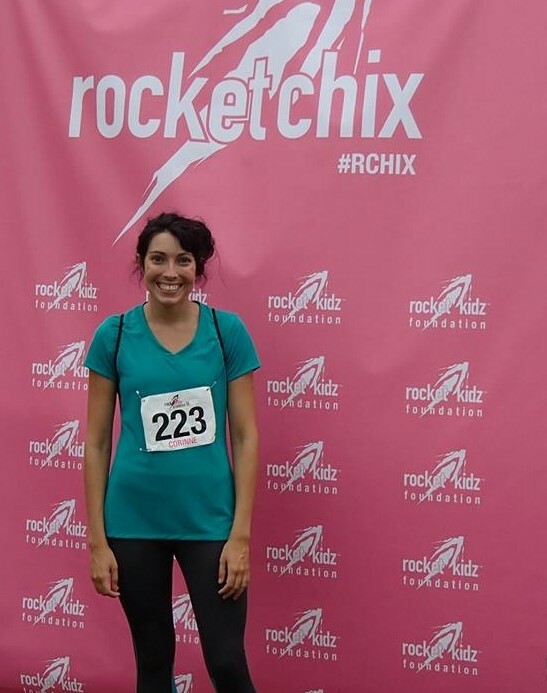 While researching local master’s swim groups a couple weeks ago, I stumbled upon a site for Rocketchix, an all-women’s sprint triathlon. The race included a 350-yard swim, 12-mile bike, and 2-mile run–I knew I could do that. And so I decided to try a tri. Of course I hadn’t owned a bike since I was a kid, so with the race only 2 weeks away I knew I had to find a bike and do some serious last-minute training. The bike-shopping proved to be quite a learning experience (see my post Rookie Cycler). The morning of the triathlon I was a bundle of nerves. A huge blob on the weather radar threatened to cancel the event, and it was already raining as I drove to LSU at 5am. When I arrived, I looked around the parking lot and saw cars decorated with 13.1, 26.2, and 70.3 stickers. Muscular women in spandex tri suits strolled by with $2000 road bikes. The competition looked fierce. Furthermore, when I rolled my bike to the transition area, I noticed it wasn’t rolling smoothly. Thankfully, the rain passed, a bike expert fixed the problem with my bike (I simply hadn’t set the front wheel on right–a rookie mistake), and I was able to get my gear organized in the transition area before 7am. At that point an orthopedist led a group stretch and we lined up for the swim. As a former year-round swimmer, 350 yards is nothing for me, so I seeded myself at 6 minutes and was one of the first five people running out the pool into transition. One of the biggest challenges of the race was getting compression pants on while I was still wet. It took me about three minutes to get those on–along with my helmet and shoes–and cross onto the bike route. The next 50 minutes were the hardest. It took all my energy to keep up with the experienced cyclers on their racing bikes. Even still, I was passed several times. By the time I was back in transition, my legs were so tired they could barely walk. I was also very thirsty and drank a lot of water and Gatorade. Not the best idea. I tried to run the entire 2 miles, but I started to feel nauseous. I didn’t think I could run anymore; had I pushed myself too hard? Just then, a girl grabbed my arm and pulled me gently back into a run. “C’mon, you can do it! The finish line is right there! Let’s run it!” And suddenly my stomach felt better and my energy returned. I kept up with my encourager and we ran into the tunnel of cheering spectators, or “tunnel of love”, and crossed the finish line! Although this wasn’t a long-distance triathlon or an Ironman, it proved to be quite difficult–possibly the most physically demanding challenge I’ve ever faced. I have that much more respect and admiration for people who have completed long-distance tri’s, especially those who have done so despite a physical disability or medical condition. There were a lot of amazing women, volunteers, and spectators at the event who displayed great sportsmanship and comradery. It’s because of them that the other women and I were able to achieve goals, overcome obstacles, and prove ourselves that morning. Although I didn’t place at the event, I had a great time and I can’t wait until my next tri! Between now and then, I need to focus on my weakness (which was the cycling, obviously). This means finding local groups that do long-distance rides around town, and conditioning myself for the sport of cycling. In two months I’ll be running a half-marathon, so training for that will build my endurance. I’ll continue to swim and weight-train regularly, and eat healthy as usual. It will take a lot of hard work, time, and patience, but eventually I’ll work my way up to that next level.